Summer holiday has started! How have your kids been doing? Summer is the perfect time for the whole family to relax, have fun and enjoy some good food. From parties to play dates, there are many occasions for you to show off your creative food. 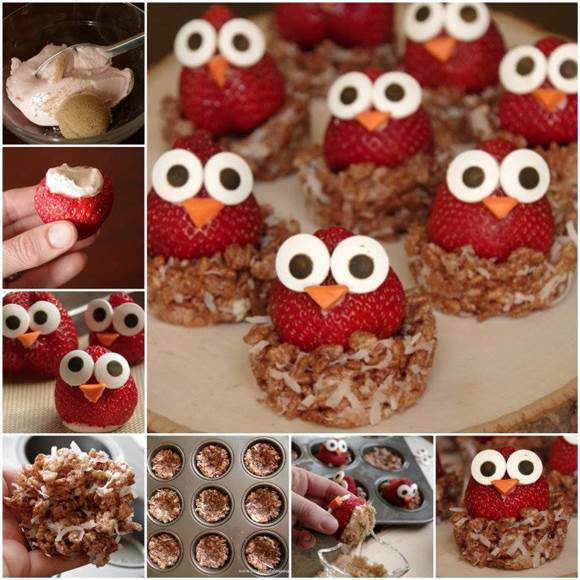 I came across this awesome recipe to make some cute owl strawberries sweet treats on Meaningful Mama and would like to share with you. They look like owls sitting on bird nests. Isn’t that adorable? The strawberries are stuffed with Philadelphia cream cheese and the bird nests are made of cocoa rice krispies, so this sweet treat is not only cute, but also yummy. It is a great dessert idea for parties and play dates. I am sure everybody will love it, especially kids!